Rosmarinus officianalis can be used for ornamental, culinary and medicinal purposes. The aromatic, evergreen shrub, native to the dry hills of southern Europe and North Africa, can be grown as a clipped hedge, as a cascading plant along the edge of a retaining wall, pruned and shaped as topiaries and as a container patio plant. Rosemary leaves are like soft pine needles, finely chopped they can be used to flavour a variety of dishes, especially stuffing. Many cooks simply cut sprigs of rosemary and place with roasted meats, especially lamb, pork, chicken and turkey with great results. Another great advantage of rosemary is that it is a perennial and will last for twenty years or more with only minimal pruning once a year. 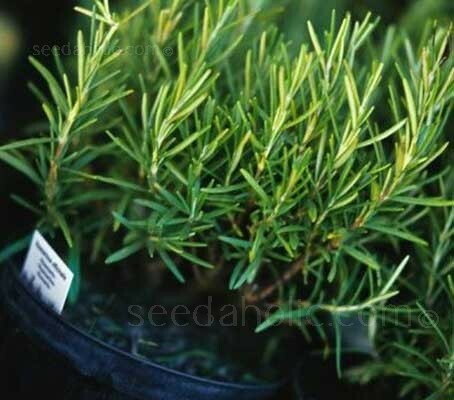 While rosemary can be propagated by taking cuttings, the finest, more aromatic plants are said to be raised from seed. This seed is organically produced. The seed has been harvested from plants that have themselves been raised organically, without the use of chemicals. Sowing: Sow in Sept to Oct or March to May. Sow seed on the surface of lightly firmed, moist seed compost in pots or trays. Press the seeds lightly into the compost but do not cover, as they need light to germinate. They will germinate in less than two weeks. The germination rate for Rosemary can be low, perhaps 30 to 50% so, either plant a few more seeds than you would normally do, or increase germination by sowing at one week of warm temperatures of 18 to 24°C (65 to 75°F), followed by cold temperatures of 4°C (40°F) for four weeks. The fridge is the ideal temperature! Seedlings should be ready to transplant in six to eight weeks. Avoid keeping the medium too moist. Transplant to 7.5cm (3in) pots or trays. Gradually acclimatise to outdoor conditions for 10 to 15 days before planting out, after all risk of frost. When transplanted, pinch out the tip of each stem to encourage the plants to bush outwards. Trim new growth to maintain a compact shape. Rosemary, like Thyme and Lavender is one of those plants which will not re-grow if cut back too hard, if you need to trim them wait until new growth buds appear in the spring and cut back to the lower ones. If trimmed back when you can see new growth buds, it will stay fresh and healthy for many years and flower well. Outdoors, plants should be placed in an area with good air circulation and well-drained soil. Cut and dry whole branches. Save sprigs in olive oil. 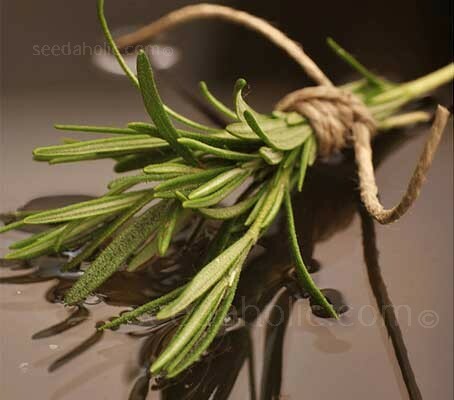 Rosemary leaves are known for relieving cold symptoms and headaches. Made into an herbal tea is also believed to stimulate liver activity and improve blood circulation. Rosemary is the companion plant to Cabbage, Beans, Carrots and Sage. It repels Cabbage Butterfly, Bean Beetle and Carrot Fly. 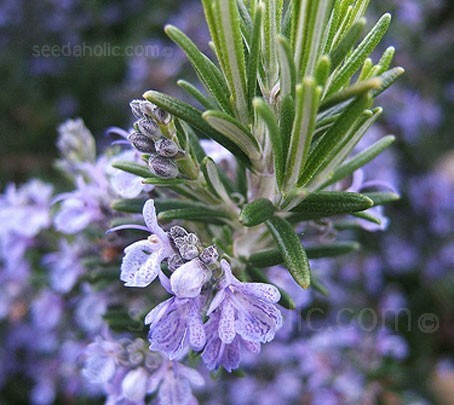 Native to the Mediterranean basin, Rosemary, Rosmarinus officinalis, is a woody member of Lamiaceae, the mint family. It is thought that the name originated because the plant lives in the harsh, dry climate and seems to exist with only the humidity from the sea. In ancient times, when all plants were associated with an emotion, rosemary was known as the herb of remembrance. Sow in September to October or in March to May.